Everyone has their favorite games with the free promotions. But i can say i would prefer free spins, from everything else. I now had 5 free spins on epic ape,..
iff anyone can manage to come in the free game,.. I am excluded from all free promotions at william hill for few weeks,so cant tell anything about this free gifts from them!dont know will something change when this promo with scratch card finish or I will be out from everything in future also!but very stupid from them! William Hill took a long break with the freebies today they have fifteen seconds of free spins over at Macau on Divine ways. vaci38 my friend you´re really a case! You are banned in William Hill too? What are you doing in the poker´s rooms? You has to take the candy of another player and show your tongue to him? There you won too much with the promo? I don´t understand why some players, like you or dule-vu, could be banned in a poker´s room....I'll be too good? vaci38 my friend you're really a case! You are banned in William Hill too? What are you doing in the poker's rooms? You has to take the candy of another player and show your tongue to him? There you won too much with the promo? I don't understand why some players, like you or dule-vu, could be banned in a poker's room....I'll be too good? Always be nice when talking to customer support in live chat. The best promotions at William Hill are for people living in the U.K. The scratch of the day promotion is back at William hill. I turned a one dollar slot bonus into $50 playing lightning roulette promotions along with two free bets. Good luck. we didnt have new promotions for so long time at william hill site,it think from world cup or maybe we just didnt post anything here!I couldnt use that promotion for world cup and since then I didnt even log in at their site,so dont know do I have something there to use! We’re giving you a completely free £2 Bonus to use on our new and exclusive game, Fruit Blox. Claim it while it’s ripe, as this juicy Bonus is only available from Sunday 12th until Thursday 16th August. 2. £2 Bonus will be credited. Daily Free Bingo (the “Promotion” will run from Monday 20th August 2018 at 18:00:01 (UK Time) until Sunday 26th August 2018 at 22:29:59 (UK Time) (the “Promotion Period” . The free games will be available daily at 18:00:00, 19:00:00, 20:00:00, 21:00:00 and 22:00:00 across the following rooms: Willys Den, Willys Winners, Community, BOGOF. We dont see often in sites like that, promotions in bingo. Lets see how the ones that re eligible to play, will do in the promotion. Cant see if there are some specific play through requirements or not here. thanks on this new promotion sandmanilo!will see later could I be part of it or I cant use it same as other promotion from william hill!nobody didnt respond on my post for this free money,so dont know who could use it!I know that I couldnt! 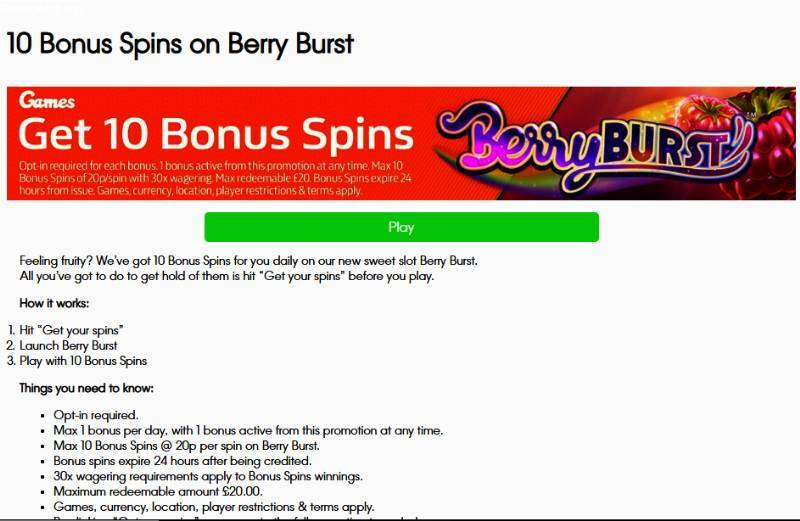 I have 5 free spins at macau on this slot,but on this promotion for berry burst I also dont have buttong to hit!its same thing like last months,that I cant use promotion like this!so probably is restricted for countries or players! I didnt even expect to have this 5 free spins!